The H1N1 flu vaccine became available earlier this month, and for many health care workers getting the vaccine is mandated. New York has created a state-wide mandate that all health care workers who have direct patient contact get seasonal and H1N1 flu shots or face the possibility of losing their jobs. Many hospitals have also created mandates, including the Hospital Corporation of America, Emory hospital, the University of Pennsylvania hospital, the University of Maryland hospital, the Loyola University health system, and the Good Samaritan Hospital in San Jose. Many health care workers are opposed to these mandates, as was demonstrated by health care workers protesting the New York mandate outside of the state capitol (video). The California Nurses Association and the National Nurses Organizing Committee have recommended that the vaccine be encouraged but “nurses should maintain their right to decline for personal reasons.” Some reasons the protesters give for objecting to the mandate (here, here, and video here) include: the vaccine is not as effective as other mandated vaccines; there are equally effective alternatives, for example, wearing face masks and washing their hands; the vaccine was not sufficiently tested and may be unsafe; and H1N1 flu is not sufficiently dangerous to warrant a mandate. A common thread throughout the protest coverage is that health care workers do not want to be told what they must put in their bodies. This morning a group of New York emergency room nurses announced that they would be filing a lawsuit to block the mandate later this week. In many states, hospital workers are already required to be vaccinated against measles, mumps, and rubella as a condition of their employment, but flu shots are voluntary. In this case, however, Professor Caplan argues that mandating the H1N1 vaccine may be the only way to obtain the individual medical and public health benefits. He reports that neither voluntary vaccinations (only 50% of health care workers elect to receive the annual flu shot) nor alternative protections like face masks (20% of health care workers who wear face masks still catch the flu) are likely to achieve the same benefits as a mandatory vaccination. Some who object to the mandate have voiced concerns about the vaccine’s safety and efficacy because they claim it was rushed through development. But the Center for Disease Control and Prevention director, Dr. Thomas R. Frieden, assures, “We have cut no corners. This flu vaccine is made as flu vaccine is made each year, by the same companies, in the same production facilities with the same procedures, with the same safety safeguards.” The vaccine is not safe for some individuals who have egg allergies or risk factors for a rare complication known as Guilliame-Barre syndrome, and they are exempt from the mandate. Some of the mandates, although not New York’s, also exempt people with religious objections to vaccination. If a mandate requiring health care workers to receive the H1N1 vaccination is necessary, then the penalty for opting out should be both fair and effective. Currently, health care workers in New York who refuse the vaccine risk losing their jobs. Could New York still reach its pubic health goals and increase vaccination rates among health care workers with a less severe penalty? For example, could the same purpose be served by notifying patients and other doctors that an individual has refused the vaccine, which would allow patients to choose to receive care from practitioners who are vaccinated? Some health care workers and their advocates would prefer a program whereby adults did not have to choose between their job and taking a vaccine they have concerns about. Individuals’ choices about their own health care should be respected, and health care professionals are likely to make informed choices. On the other hand, health care professionals’ vaccination decisions will also affect the patients they see who are especially vulnerable to the H1N1 complications. And requiring vaccinations might be necessary to protect those patients. Can traumatic events during early childhood permanently affect the way the brain responds to stress at a molecular level? Moshe Szyf, a McGill University epigeneticist, and Michael Meaney, a McGill University neurologist previously found evidence for long-lasting molecular changes in stress-response brain regions of rats exposed to poor parental care. Now, in a follow-up study, they show that similar changes may occur in human suicide victims who suffered childhood abuse. Dr. Szyf and Dr. Meaney focus on epigenetic changes, or changes “on top of the genome.” While childhood experience cannot change the actual DNA basepairs that form the genetic code, experience may permanently mark certain regions of the genome in ways that change gene expression and have long-lasting consequences on behavior. These marks include methylation of DNA basepairs and acetylation of histones, the proteins that DNA is wrapped around inside the nucleus. We are only now beginning to understand how experience can change these epigentic tags, and in turn how these epigentic tags can feedback and affect our behavior. In 2004, Dr. Szyf and Dr. Meaney published a paper on epigenetic changes caused by maternal behavior in rats. Rats whose mothers did less licking and grooming and arched-back nursing had exaggerated behavioral and hypothalamic-pituitary-adrenal responses to stressful stimuli compared with rats whose mothers groomed them more. These rats also had altered epigentic tags — increased DNA methylation and reduced histone acetylation — in the promoter of an important stress response gene, the glucocorticoid receptor gene in the hippocampus, and reduced expression of this gene. In order to show that the maternal behavior caused the epigenetic changes, some rats whose birth mothers did not groom were fostered by mothers with high grooming behaviors, and vice versa. These adopted rats showed methylation patterns similar to the mothers that reared them, instead of their biological mothers. Interestingly, the effects of neglectful maternal behavior on methylation in the promotor, altered hippocampal glucocorticoid receptor expression, and the hypothalamic-pituitary-adrenal response to stress were reversed when the adult offspring were given a histone deacetylase inhibitor, which globally removes many epigentic tags. Does childhood abuse and neglect produce similar epigenetic tags on this stress response gene in humans? In another study, Dr. Meaney’s group compared expression of the neuron-specific glucocorticoid receptor gene in the hippocampus of 12 suicide victims with a history of childhood abuse (including severe neglect) to those of 12 suicide victims who had no history of abuse and those of 12 controls. Again, they found increased methylation of a glucocorticoid receptor promotor, and less glucocorticoid receptor gene expression. This finding, that childhood abuse and neglect is associated with methylation of a glucocorticoid receptor promotor in the hippocampus mirrors the result in their 2004 paper that found the same epigenetic change in rats who were neglected by their mothers. Dr. Szyf and Dr. Meaney also looked more broadly for epigentic tags associated with abuse. In a recent paper, they compared the brains of 13 people who had suffered early childhood abuse (sexual contact, severe physical abuse and/or severe neglect) and committed suicide and 11 people who had no history of abuse and had died suddenly in accidents. The hippocampus in the brains of suicide victims had higher methylation levels in DNA regions controlling the expression of ribosomal RNA (rRNA), a general purpose gene, broadly important for protein syntehsis in a given cell. The epigentic tags resulted in reduced rRNA expression in the hippocampus. Whether or not the person had had a psychiatric illness or a substance abuse problem did not account for any difference in methylation level. The methylation differences were specific to the hippocampus, which is commonly associated with psychopathology, and did not exist in the cerebellum, which is not associated with pathology (using samples from 8 brains, 4 from each of the conditions). Thus the authors provide two examples of long-lasting molecular “scars” in humans that may affect gene expression and behavior. This research is very interesting but not without caveats. The authors acknowledge that they have not been able to account for other environmental factors besides childhood abuse and neglect that might cause these epigenetic changes. Future studies would require much larger sample sizes to address other possible causative environmental variables. Also, the authers show “scars” on two genes, one important for stress-response and one for protein synthesis, but there are twenty-thousand genes in the human genome. With new technologies to look at epigentic tags on a genome-wide level (the epigenome), future studies can look at all genes in an unbiased manner for a more complete picture of epigentic “scars” that are enriched in people who suffered from childhood abuse and neglect. Finally, we should be careful not to conflate suicidality with abuse; this research does not directly address suicide risk from abuse. This has been making the rounds in the neuroscience world, but deserves attention in cross-disciplinary fields. A group of top-notch fMRI researchers presented an unusual paper at June’s Human Brain Mapping conference. Salmons have very small brains. Clearly, the fish did not perform well at the task, and thus we have not learned much about interspecies perspective taking. The work is, however, a compelling and humorous demonstration of the problem of multiple comparisons. This is a principle in statistics that basically says when you’re looking at enough bits of information (i.e. doing lots of statistical tests), some will seem to be what you’re looking for – purely by chance. In fMRI experiments, there are a LOT of pieces of data to compare, and without statistical correction for this phenomenon (which is not always done), some will indeed be significant, just by chance. In early 2008 I was working with my co-adviser George Wolford on a presentation he was giving regarding the multiple comparisons problem in fMRI. 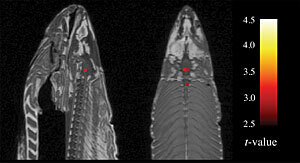 We were discussing false positives in MRI phantom data and I brought up the idea of processing the salmon fMRI data to look for some ‘active’ voxels. I ran the fish data through my SPM processing pipelines and couldn’t believe what I saw. Sure, there were some false positives. Just about any volume with 65,000 voxels is going to have some false positives with uncorrected statistics. Rather, it was where the false positives occurred that really floored me. A cluster of three significant voxels were arranged together right along the midline of the salmon’s brain. Bennett et al are apparently having a hard time getting the paper published. The use of multiple comparisons corrections in fMRI studies is a contentious one, as some researchers think it may be overly conservative and thus miss true positives. As a solution, Bennett suggests reporting both sets of data, corrected and uncorrected. The moral of the story for interdisciplinary folks: note whether multiple comparisons correction data have been reported (or not). And always bear in mind that there are a lot of assumptions and decisions being made behind the ultimately reported data in any neuroimaging study. The lobotomy continues to fascinate and to haunt. How could the 1949 Nobel Prize for Medicine or Physiology go to Egas Moniz for the invention of a procedure that, within two decades, was rejected, with horror, as barbaric? As a matter of inside Nobel politics, there has long been some thought that Moniz really won the prize for inventing angiography, but the Prize is given for an invention or discovery, not for a body of work, and the citation is for the “frontal leucotomy.” The terms frontal lobotomy or prefrontal lobotomy were popularized by the procedure’s American exponent – Walter Freeman, the neurologist who invented the surgical procedure that allowed out-patient use of the procedure, the “ice pick” (literally in the first cases) through the orbit behind the eye. This same Walter Freeman ended his career with an office in the wealthy Silicon Valley (then in its silicon infancy) suburb of Los Altos. And, in 1960, he “gave” (the verb seems wrong) a prefrontal lobotomy to a 12 year-old boy named Howard Dully. My Lobotomy is Dully’s story, told by the now 60 year-old Dully himself, with the aid of writer Charles Fleming. The book began as a result of a National Public Radio program on lobotomies, which, in effect, became a program on Dully. Dully had been a difficult boy, but not, at least as he tells the story, a particularly abnormal one. He speculates, plausibly, that today he might have been diagnosed with ADD or ADHD. He believes his stepmother hated him, irrationally, and was willing to do anything to make him disappear, before and after his “successful” lobotomy. Freeman, he thinks, was gripped by an overriding urge to keep experimenting with his procedure, extending it still further to children, including Howard, whom he diagnosed as having had juvenile schizophrenia since age 4. After the procedure Dully did not become a zombie or an idiot. It sounds, from his description (the main one we have) that he became more detached and vague, at least for a while. (Freeman, however, thought his improvement was remarkable.) His stepmother still would not take him back into the home so he drifted back and forth from the juvenile hall to Agnews, a state hospital for the insane, to a special school for the disabled. As an adult he lived mainly on social security disability payments and a few women in his life, engaging in too many drugs, too much alcohol, and occasional petty crime, until, at about age 45, he decided to straighten out his life. He seems to have done well; he has supported himself and his wife through driving a school bus and training other bus drivers for most of the last fifteen years. The book is mainly Howard’s story, of his family and his early life. His misbehavior in school, his childhood trips to the mountains, or his complex and painful relationship with his stepmother may or may not interest you, depending on your tastes. The discussion of Freeman, and the contents of the notes Freeman took on Howard, are more interesting from the perspective of neuroethics. I would have liked more scientific discussion of the lobotomy generally and of Howard’s case in particular. But this is Howard’s memoir, not a scientific report on him. The latter may be coming. According to the afterward of the paperback edition of the book, Dully has now been scanned in an MRI. The researchers found major brain damage that they would expect to render a person completely incompetent. They can only attribute his normal or close to normal life to the remarkable brain plasticity of the young. I understand that they hope to have a manuscript submitted around the end of 2009. That paper should be well worth reading and will make this already interesting memoir even more useful in neuroethics. “The commentary “A Warning Sign on the Road to DSM-5: Beware of its Unintended Consequences” by Allen Frances, M.D., submitted to Psychiatric Times contains factual errors and assumptions about the development of DSM-V that cannot go unchallenged. Frances now joins a group of individuals, many involved in development of previous editions of DSM, who repeat the same accusations about DSM-V with disregard for the facts. This observation parallels the speculative worry Frances expressed in his editorial that time pressures on the DSM-V task force may soon lead to an unconsidered rush of last minute decisions without empirical support. The work that the DSM-V task force is doing is of a significance barely comprehensible at present, as it will determine both disease categories for millions of individuals, and delineate drug markets for the world’s largest pharmaceutical companies. Given this fact, how important is it for social scientists, lawyers, historians and philosophers to monitor the internal politics of this process? Genetics researchers have the assistance and resource of ELSI scholars, but is there an equivalent, well-organized network of researchers devoted to critically analyzing the social, ethical and legal ramifications of the work on the DSM? Is the DSM-V process really the most open and inclusive process of its kind to date? It may be the case that some of Frances’ arguments misapprehend the actual situation, but would he be making these kinds of worried, speculative arguments if it were truly an open process? Is it possible that controversy of this sort could lead to more transparency from the DSM-V task force? Does the proliferation of medical blogs penned by high-profile academic researchers help or hinder the process of disease definition? What will be the public health impact of the universal accessibility of this information?